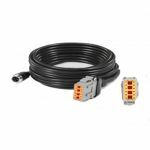 The cable comes with screw end connectors and a rubber O-ring creating a waterproof join. The cable is airline aviation cable and has a 4-pin female end and a 4 pin male end. Our brand of cameras have a female ended connection cable and requires a 4 pin male ended cable. 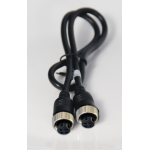 Our brand of monitors have the male ended connection and require the female ended cable connection. 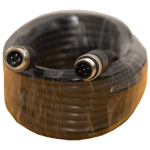 The cable is available in 5, 8, 10, 12, 15, & 20 meter lengths.